University Archives is hosting a hands-on pop-up exhibit of vintage Cal Poly yearbooks from the University Archives. Drop by the library’s main entrance on Saturday, April 8, 10 a.m. to 2 p.m. and step into history. The story below was originally published on April 11, 2014. The history of Open House, one of Cal Poly’s largest annual events, spans as far back as 1904. We’ve digitally gathered some of the records that tell its history from University Archives to share with you. The first open house event on campus, The Farmers’ Institute and Basket Picnic, was held May 24, 1904, during the first school year. 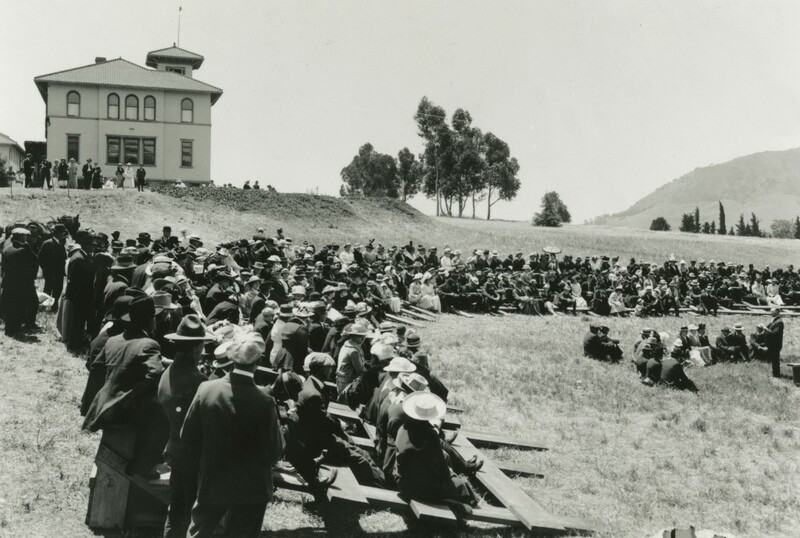 The founders of the California Polytechnic School decided to “hold a monster picnic at the school in early May when noted educators and prominent citizens will address the people.” More than 200 visitors attended that first Farmers’ Institute, touring the school’s new buildings, eating barbecue, and listening to presentations by visiting professors. The Farmers’ Picnics provided an opportunity for early visitors to tour campus and hear lectures by prominent speakers of the day (University Archives Photograph Collection, University Archives). By 1910, the Farmers’ Institute was so popular that the Pacific Coast railway offered reduced fares, which attracted more than 800 visitors. In 1913, over 3,000 persons attended the Farmers’ Institute, which was combined with celebrations of the school’s first ten years of operation. The Decennial Farmers’ Institute featured a barbecue, a pageant of San Luis Obispo history, and commencement ceremonies for the class of 1913. By the 1920s, however, the Farmers’ Institute had disappeared, perhaps a victim of funding uncertainties during this period. In 1933 plans began for a new campus open house. Cal Poly President Julian McPhee supported this new annual event as a way of publicizing the school while preparing agricultural students for livestock judging at the state level. Various names –– “Little International” and “Cal Poly Agricultural Exposition” –– were considered and discarded; eventually Poly Royal was selected as the official designation. The event was billed as “A Country Fair on a College Campus” and students and faculty alike began preparations to show their campus to visiting parents, alumni, prospective students and other visitors. On March 31, 1933, hundreds of visitors thronged the campus for the first annual Poly Royal. President McPhee supported Poly Royal as party of his strategy for reinvigorating the college. From its inception, Poly Royal exemplified Cal Poly’s learn-by-doing philosophy, with its livestock exhibitions and student project showcases. Other attractions at the first Poly Royal included horticulture judging, tours of the industrial shops, a baseball game, and presentations of awards. Examples of programs from events at Poly Royal in the 1940s and 1960s (Poly Royal Collection, University Archives). The second annual Poly Royal expanded to two days of celebration, showcasing an increasing number of the school’s programs and student achievements. Poly Royal became a high point in the campus social calendar until World War II forced campus to downsize and then cancel the event, due to gas rationing and wartime restrictions. After the war, Poly Royal resumed its full schedule. Through the years, the exhibits evolved as the curriculum did, adding architectural designs and landscaped model houses, rodeo competitions, and home economics fashion shows to highlight the results of student work accomplished during the academic year. Student organizations sold a variety of food, t-shirts and other commemorative items to the crowds, and their profits supported club activities. In keeping with the traditional theme of a “country fair,” Poly Royal offered many crowd-pleasing activities that attracted locals and students alike. Cow-milking contests, nail-driving competitions, and the milk can roll were open to the public, while the famous tractor pull and rodeo were limited to student entrants. In 1990, Poly Royal became of a victim of its own success when an unruly crowd of over 1,000 gathered on Friday night, April 27, near campus. They threw rocks and beer bottles, overturned cars, and vandalized stores and residences along California Boulevard until subdued by police. Authorities cited out-of-town revelers, alcohol abuse, and the large crowds of more than 100,000 swelling the campus and town for the celebration as factors contributing to the melee. After much soul-searching and discussions with police and community groups, President Baker called for a “reassessment of Poly Royal.” Further celebrations were suspended until 1994, when campus and community leaders approved a new annual celebration, which they named Open House, a smaller version of the traditional event that refocused on student programs and accomplishments. Now at the 21st Open House, we celebrate both the university’s history and its learn-by-doing educational philosophy. Learn more about Cal Poly’s history at University Archives’ timeline, or visit us in the Kennedy Library (Fourth Floor, Rm. 409, Monday – Friday 9am-4pm). This is a collaborative post by Special Collections and Archives student assistants Brittany Bratcher, Soquel Filice, and Alex Thomas. The text was adapted from content published in Cal Poly: The First Hundred Years. Read more on cal poly history, Open House, Poly Royal, special collections and archives, and university archives. I met my husband on the Friday night of the last Poly Royal in 1990. We were downtown at DK’s West Indies Bar and had no idea that the riots were going on up by campus until we heard about it the next day. Now my husband (CSC ’86) and I (EL ’90) have three teenagers and we hope one of them ends up at Cal Poly. We love Cal Poly!